Halls in country residences are often designed in such a way that they are compound with the upper floors of the house. And as a result, the hall in the Classic style was decorated taking into consideration the decoration of the upper floors. Only in this case, the core of the house will be created, around which the exclusive and status Interior will be built. 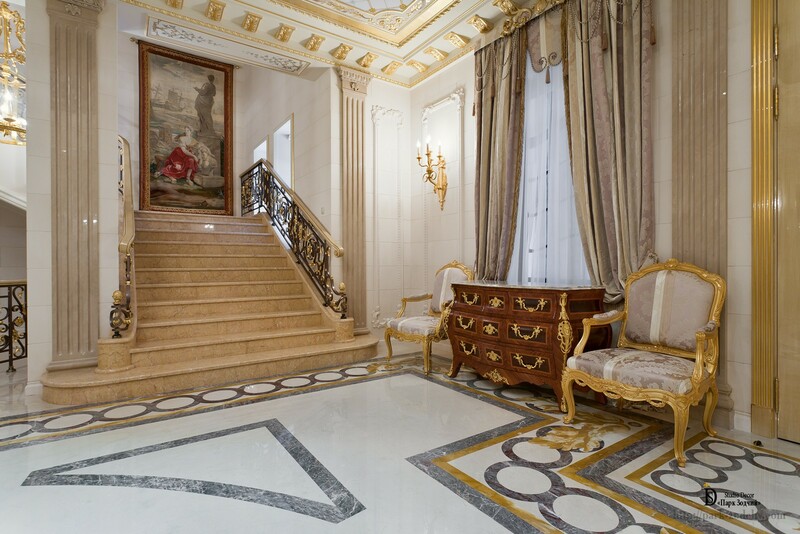 The hall in the residence is decorated with rich materials: marble floor with marvelous pattern that echoes the form of chic chandelier and magnificent stained-glass window of the upper floor. Thus, the core of the house has been created. There are the following Classic-style elements in the hall: stucco pilasters with gilded capitals, gilded volutes and stucco moldings of the ceiling. Wall are decorated with mirrors including white stucco molding decoration. Fine ornamental mural paintings echo similar elements of the upper floors. Forged items of the staircase are similar to the floral pattern of the ornamental mural paintings. Textiles are of subdued tones that does not detract from the richly decorated chest and armchairs. It’s worth paying attention to the painting in the Renaissance style, that is wonderfully visible from the lower floor. It is not a joke. The decorators have decided to give the home its own heaven, which give the inexpressible beauty of sunlight glare to the hall and various floors of the residence. This choice has allowed combining not only the rooms, floors, but in fact compounding the interior space with external environment. Color scheme has been chosen very subtly and intelligently: light ornamental grisaille mural paintings with blue pattern complement the light background and exquisite gilding. 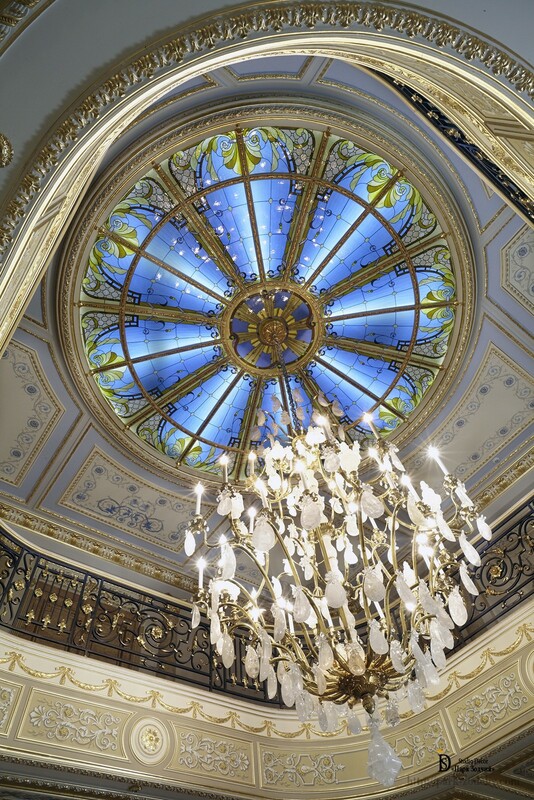 Stained glass ceiling is performed so skillfully that blurs the very notion of a closed internal space. For the Interior not looking monotonous, the color of the stair railings and corridors have been in a darker color with gilding. This creates a patterned security barrier. It is always difficult to decorate two-colored space, because the décor of all floors must be carefully compounded. But at the same time, it must be ensured, by using decorative techniques, that the Interior would not be monotonous or boring. This especially refers to large residences. In our case, the masters have chosen the correct approach to decoration. Ornamental grisaille mural paintings on different floors have their own color scheme and exclusive pattern, stucco moldings in the Interior have been chosen in the same way: the lower floor is decorated with moldings, and the upper floor is decorated with festoons, monochrome ornamental mural paintings and medallions. The staircase, the form of stained glass ceiling and décor of the marble floor in the hall have become the unifying element. 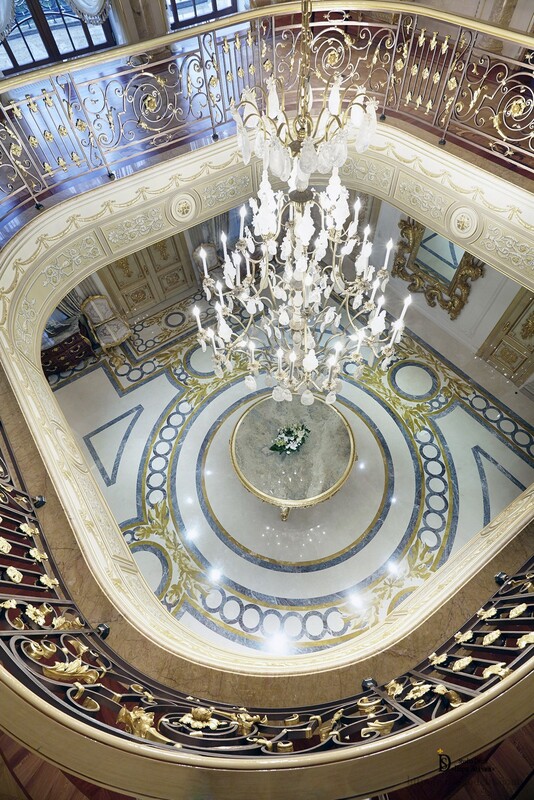 The unspeakably beautiful chandelier as if strings different floors on itself, thus joining them together.